Tuscany represents a journey of leisure, pleasure, cuisine and of course, discovery: Marvellous scenery in a landscape full of colorful rolling hills, massive mountains and numerous rivers – every valley is a waterway and rich in history, encompassing the ancient as well as modern, urban, and artistic. When travelling, you’ll find perfectly preserved hill towns, fabulous art, the most beautiful countryside imaginable, almost tropical coastal areas, great cities (e.g. Florence, Siena, Pisa, and Lucca), top quality restaurants and food stores, possibly the best cafes in the world as well as friendly and beautiful people. Tuscany’s culture spans centuries of ideologies and rural and city life in a rich tapestry of art and history, as beautiful as it is fascinating. In addition to the fame of Florence, Lucca, Pisa and Siena, Fiesole, Arezzo, Carrara, Volterra and San Gimignano, and countless other corners of the region hold delightful gems to which one can only wish to return. So in the following posts, I will take you with to these four places: Pisa, Florence, Siena and the famous Cinque Terre (“the five lands” – actually not in Tuscany, but close enough and a must see if you’re staying as close as in Pisa!). 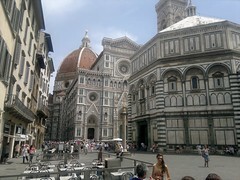 The most popular areas of Tuscany are around Florence (the capital of the region) or Siena. Florence is a larger town (population of ca. 300,000) and Siena is smaller (around 50,000). Anywhere within a 45 minute drive of Florence or Siena will be a good location for a first time countryside visit. Florence became prominent after the death of Matilde di Canossa, the last of the Marquises of Tuscany, in 1115 and the defeat of the Pisans by the Genoese at the battle of Meloria. Florence’s subsequent rise was inexorable, culminating in the Nineteenth Century, when the State of Lucca was annexed to its territories. Cinque Terre is on the UNESCO World Heritage List. The name means Five Lands and comprises the five small coastal villages of Riomaggiore, Manarola, Corniglia, Vernazza and Monterosso located in the Italian region of Liguria. On our one week family trip, this was to me the highlight of sightseeing. Again, I will give you more details in a separate post – so stay tuned! 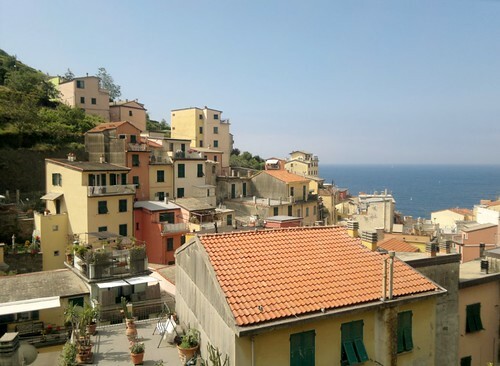 In the meantime, you might think about finding some connection between the name Cinque Terre and the name of my blog: RennyBA’s Terrella !?! 1: A Taste of Florence to a family from Norway. 2: Family from Norway touring Medieval Siena in Tuscany.